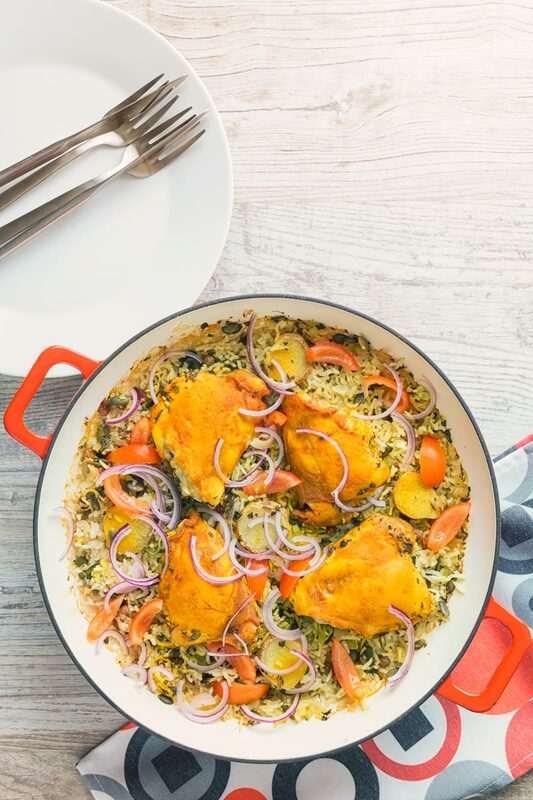 Baked One Pot Chicken and Rice with Indian Flavours. I like to think of this recipe as a bit of a lazy take on a chicken biriyani. That dish is a labour of love, this dish is a bit of tinkering in the kitchen but other than that a very easy dish. It was born of some wifely nagging, can I say that? Oh look, I just did… Anyway, after much badgering, I agreed to do some work on a baked chicken and rice recipe. I only wished I had done it earlier, this recipe has rapidly become a favourite for us. I like to make it really quite spicy but you can scale that back by omitting the chili powder and using less pokey chili peppers. How to Bake Chicken and Rice. There a couple of take away points from this recipe you can use to short cut some of my experiments. First of all if you are going to cook one pot chicken and rice you should remove the skin! Most of the ‘fat’ on a chicken thigh is on the skin. Baking the thighs with the skin on allows this fat to leach into the rice. Ordinarily, I have no issue with fat, it is where a whole level of flavour lives. However in this instance, that fat leaves the rice feeling very claggy and rather unpleasant. It is much the same reason that I remove the skin in my chicken hotpot recipe. Secondly, use hot stock, it gives the rice a good head start and leaves you with perfectly cooked rice! Cold stock has to come to temperature in the oven. This once again leaves the rice with a starchy and soggy texture by the time it is cooked. What Other Flavours Would Work? I’ve gone with Indian flavours for this recipe but you can use it as a base and take a stroll around the world. 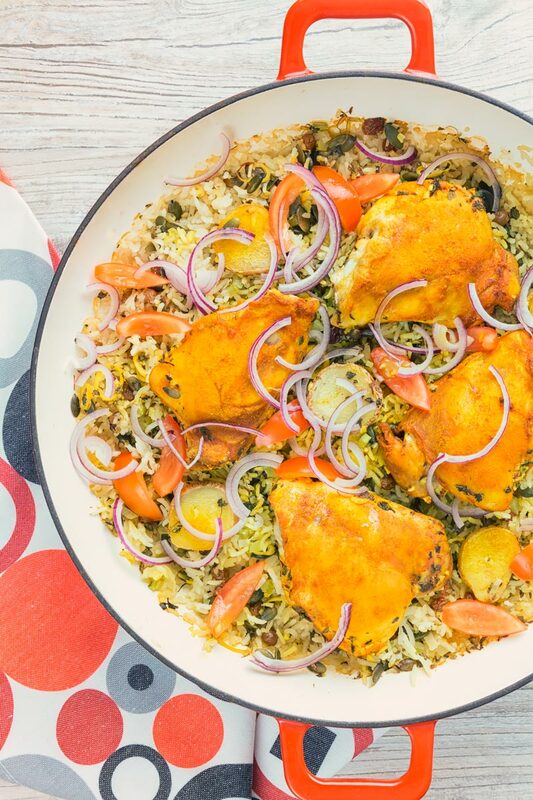 North African: Think Harissa on the chicken thighs and preserved lemon and chili in the rice. Thai: Go with a red or yellow Thai curry paste mixed with coconut milk on the chicken. Galangal, coriander and lemongrass in the rice. Italian: A sun-dried tomato paste on the chicken and herby rice with some roasted red peppers or maybe artichokes. These are just a few ideas that have sprung to mind. Let’s see how many of them turn into recipe links in the near future! 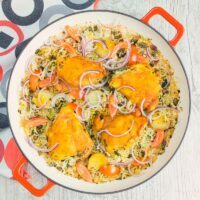 Baked one pot chicken and rice is a supremely simple midweek meal, my version leans on Indian flavours and is rich with fenugreek and spicy with chili... I like to think of it as a lazy boy biriyani! Finely dice the onion and celery and place in a heavy based pan. Finely slice the chili and add it to the pan with the raisins and the pumpkin seeds. Add the cumin, fenugreek and rice to the pan and stir. Mix together the coriander, Kashmiri chili powder and turmeric together. Season the chicken with salt and then massage in the spice mix. Cut the ginger into "coins" and place on top of the rice. Pour over the chicken stock and then nestle in the chicken thighs. Cover with a lid or foil and bake in the oven at 180°C or 350°F for 30 minutes. Remove the lid and cook for another 15 minutes. Whilst this is cooking finely slice the red onion and deseed the cherry tomatoes. Fluff up the rice and serve sprinkled with the red onion and tomato. A perfect pot chicken recipe. I will try it my own for sure. Thanks for this dear. I can’t wait to try this recipe. I made your Chicken Kofta Masala last night for dinner. Another fantastic recipe. My husband and I ate the whole thing and were mopping up the last of the sauce with naan. Next time I will double the recipe and will hope to have some left overs. Thank you for this wonderful web page where I can find Indian recipes that make me smile. Best to you and your wife. Thanks Gail… As you can tell Indian flavours are a real favourite of mine! 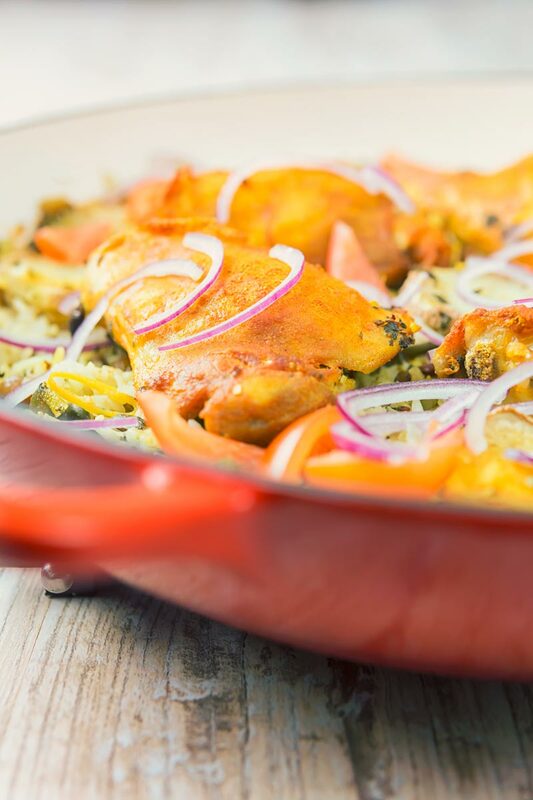 This is a fun little recipe, I have a traditional Biriyani recipe on here but as with all traditional biriyani it is a labour of love and all the better for being that, this however is stripped back really easy and really tasty. I don’t think that would work, I would use the coconut milk to marinade the chicken, although you could mix some through the stock but if you add too much you would end up with a savoury rice pudding which would be an odd texture. Thanks for your thoughts on it. I’ll make the salmon curry first I think. Love salmon and I spotted your Thai Red Duck Curry with Pineapple which sounds great too. Lychees are nice also instead of pineapple with duck curry 🙂 It’s lychee season around Christmas here in the tropics so I’d have to use canned but that’s fine. I’m so excited it’s mangosteen season now though and better get some more from the weekend markets while I can! Oh and custard apples and persimmons! Lychees sound great in a curry, not something I had ever considered, we rarely see them here in Hungary but I would eat them all of the time in the UK. In fact, your whole message really underline how big and wide the world of food is, mangosteens and custard apples I have of course heard of, but I have never seen them for sale in almost 30 years of being a fanatic cook. Persimons I do see occasionally but I’ve not considered adding them to my cooking mojo! Looks like a tasty and easy meal. Lazy biriyani definitely sounds like my kind of meal! 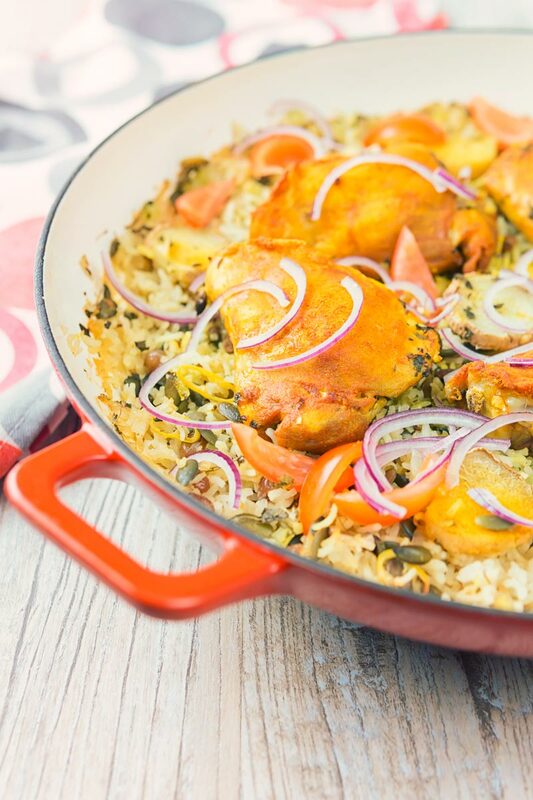 I just love how easy it is to make this one pot chicken and rice recipe. 10 minutes + chuck in + tuck in = culinary pleasure! I especially like the part of removing the skin – such an important detail to make some incredible rice. Looks like a delicious dinner! Love one pot meals. One pot meals are the best and this one is simply bounding over with flavor! Delicious! YUM!! My family would love this weeknight dinner! Thanks for the tip on cold broth v warm to cook the rice. Makes perfect sense. And your suggestion to make an Italian version of this is right in my wheelhouse!